While the mighty Troopy already hangs its spare wheel off the rear ‘barn’ door, I’ve been wanting to relocate that spare to a dedicated arm to help prevent potential future door cracking via the heavy rim and tyre combo, plus wanted the option to carry a second spare or a couple of jerry cans when needed, plus I have a few sneaky storage options to help alleviate carting six bodies (almost) everywhere I go… ahh just one of the problems of having four kids! Kicking off in 1999, MCC 4x4 Accessories are no strangers to supplying Australia and various countries around the world with aftermarket bull bars, rear bars, roof racks, side steps and draw systems. Double and triple checking MCC, I found they are a member of the AAAA (Australian Automotive Aftermarket Association) and the Australian 4WD Industry Council and receive generally good reviews from keyboard heroes and real life users alike. So, after much comparing of products and given they are no flash-in-the-pan mob, I figured on giving them the nod for one of their rear bar wheel carriers and I’d even give it a go at fitting it myself to save a few more bucks. 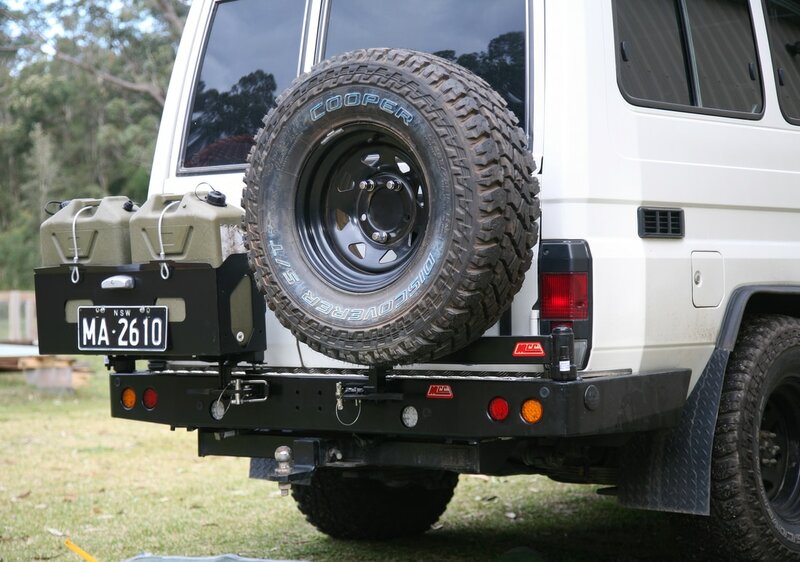 MCC provide rear bar options of the bar with just one spare wheel carrier, dual wheel carriers or, as I wanted, a spare wheel carrier plus double jerry holder. A few points that helped make up my mind to go with MCC is that each bar includes four high lift jacking points (one each side and two at the rear), each arm can handle up to a 35 inch tyre (mine is only 33 inch) and incorporate adjustable heads, easy to use latches to hold the arms closed, self-locking pins to hold the arms open, pre-drilled parking sensor holes with rubber caps for when they are not used, plus neat round LED park, brake and reversing lights. Each arm can easily be removed – the spare on mine will never be taken off, but I could imagine not needing the jerries for around town so that can save a little weight when not needed. While some MCC models offer an inclusive towbar, my setup utilises the standard Toyota towbar, so the new bar fits above it. Once offloaded from the courier truck, I spent the next hour eagerly unboxing, unwrapping and untaping the whole kit – there is no way this stuff would get damaged in transit given the pile of plastic and cardboard left over! I must admit to hating wading through IKEA-style instruction manuals but was a little put off by the bags of nuts, bolts, washers and brackets with no step by step “How To” instructions; rather, there is just one exploded diagram showing how all the parts fit together – surely it couldn’t be too hard for a first timer like me? Initial perusing of the components left me pretty impressed and happy with my decision at going with MCC; all welds seemed to be neat and tidy, all powder coating was even and all holes, slots and patterns look first class. Then I spotted the bends in the carry arms! While I’m sure they will be sturdy enough to take the weight of a wheel and a couple of jerries, they do look as if they’ve been bent over Arnies knee with resulting bulged bends and look far less professional than the rest of the impressive kit. Aside from that, I hooked into removing the original rear bumper bar and door mounted wheel carrier and tipping all those new nuts and bolts on the shed floor. Being a first time fitter of a rear bar, let alone an MCC rear bar, the job was a lot slower than you’d expect a shop job to be. I did also strike a few problems via the already fitted towbar brackets and the larger diameter Taipan exhaust system preventing some of the MCC brackets from fitting easily. That would be the same deal regardless of brand of rear bar, but worth noting for anyone contemplating doing this sort of stuff at home – no accessory manufacturer can cater for every different extra that may be fitted to your 4x4. Another small hurdle I had to clear was the different plugs that MCC provide for the inbuilt LED brake, tail, blinker and reverse lights; they are different to standard Toyota offerings, plus I needed extra wiring to cater for the extra pair of MCC reversing lights. Taking the easy way out, I opted to dump the Troopy at my local sparky to rewire and provide waterproof connectors and load resistors needed to ensure the LED blinkers blink at the correct rate – a necessity given LED’s place less load than traditional halogen bulbs. While I could have spent a month of Sundays manufacturing a few custom brackets to get around the aforementioned custom exhaust and towbar mounts, again, I took the easy way out and palmed the job off to my local mechanic, come parts fitter, come jack of all trades to get the job done sooner. Loading the dual arms onto the main bar, I greased the bearings, spun the castle nuts on tightened and locked it all into place via the final split pin – exactly the same as a wheel bearing on a trailer. With the right hand side spare wheel in place, the left hand side dual Jerry holder bolted onto the arm and all locking levers and weight resting pads adjusted, I couldn’t help but try the high lift jack points on the rear and both sides – just to be sure it would all work as planned if the mighty Troopy does ever get stuck. Being recessed round holes on the sides (instead of square) aids in the jack tongue easily slotting in regardless of angle of the stuck 4x4. Although the tongue of my jack wouldn’t slot all the way home through the side round holes, it did go in far enough to do the job. Using the rear high lift jacking points, the arms do need to be opened to get past the spare wheel and jerries. All up, I’m stocked with the MCC bar and initially I’ll use the dual jerry holder as intended, but looking at changing that to a custom storage idea utilising the existing arm. There is some movement in the right hand side arm that holds the spare wheel, so time and corrugations will tell how it all holds up with all that weight hanging off it.